Keep your BBQ in perfect condition with this wonderfully durable waterproof grill cover from Berndes which will protect from grill to wheels. 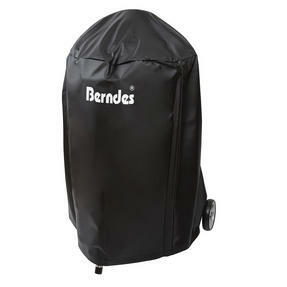 Measuring 60 x 76 cm, the cover is designed for the Berrndes BBQ charcoal grill but will fit most medium sized barbeques. The cover is designed to prevent wind and rain damage to barbeques, simply place the cover over the top when it is cool and it will ensure that your BBQ is ready for action when the sun comes out. Keep your BBQ in perfect condition and ensure you are ready to cook outdoors whenever the weather allows with this Berndes cover. Measuring 60 x 70 cm the cover fits snuggly around the Burndes charcoal grill to protect it from the top of the grill down to the legs. With a sleek black exterior this cover will look smart in your garden so you will not have to hide it away when the BBQ is not in use. Wonderfully durable and waterproof, this cover is superb at preventing rain and wind from causing any damage to your BBQ. 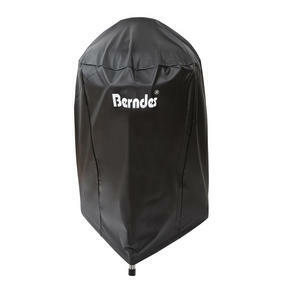 If you want your BBQ to last, this cover is a fantastic way to maintain its condition and reduce the chances of rust.